Nothing hits the spot in the cold winter months like a delicious hot sandwich packed with delicious melted cheese. This Italian sub sandwich takes minutes to assemble and with a quick ten minutes in the oven, it’s ready to eat hot and fresh. It’s full of meats and cheese but the giardiniera mix, found in the pickle aisle, really brings out the flavors in this sandwich. This recipe makes six sandwiches that are perfect for dinner or a party. Hot soup and a hot sandwich make you feel warm inside after being out in the cold. Hot sandwiches are especially great during the cold winter weather. 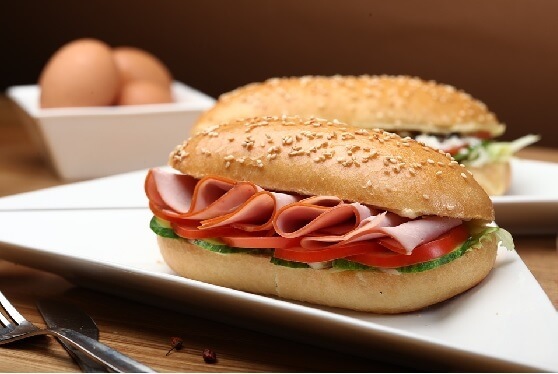 This sub sandwich has lots of melted cheese and meat for a great flavor.